Malaysia, a multi-ethnic and multi-cultural country, is a federation of thirteen States and three Federal Territories with eleven of the States and the Federal Territories of Kuala Lumpur and Putrajaya located in Peninsular Malaysia. The State of Sabah together with the Federal Territory of Labuan and the State of Sarawak are located in the island of Borneo respectively. Peninsular Malaysia is separated from Sabah and Sarawak by 720 km of the South China Sea, giving the country a coastline of almost 4,830 km. With a total land area estimated at 32.83 million ha, Malaysia is the 67th largest country in the world. In this context, Peninsular Malaysia with a total land area of 13.16 million ha is located between latitudes 10 20’ and 60 45’ North and between longitudes 990 40’ and 1040 20’ East. Its maximum width is 322 km with a length from the northernmost to the southernmost tip of approximately 740 km. Parallel mountain ranges in northwest-southeast direction characterize the northern and central-western parts, with peaks about 2,000 m high with the highest point being 2,190 m. The two largest rivers, the Perak River and the Pahang River, flow towards the straits of Malacca and the South China Sea respectively. Tanjung Piai, located in the southern State of Johor, is the southernmost tip of continental Asia. Sabah with a land area of 7.37 million ha is located between latitudes 40 and 70 North and between longitudes 1150 20’ and 1190 20’ East. It is situated at the northern tip of the island of Borneo. The central mountain ranges rise abruptly from the west coast to Mount Kinabalu at 4,101 m, the tallest mountain in Malaysia and one of the highest peaks in South East Asia. It is protected as the Kinabalu National Park, a UNESCO World Heritage Site. Many rivers in Sabah flow northwest and east to the South China Sea and Sulu Sea. The, largest, the Kinabatangan, is navigable for considerable distances and waters an extensive plain. Sarawak, having an area of 12.30 million ha, is situated on the northwest coast of the island of Borneo between latitudes 00 50’ and 50 North and between longitudes 1090 35’ and 1150 40’ East. Its maximum width is approximately 257 km with a length of about 740 km. In Sarawak, the eastern mountain ranges rise to more than 1,520 m and contain the Mulu Caves, the largest cave system in the world. The largest river, the Rajang, is 564 km long and is navigable for almost 160 km. The highest point is Gunong Murudi at 2,420 m which is situated on the border range with Kalimantan, Indonesia. The climate of Peninsular Malaysia is typically humid tropical or wet equatorial and is characterized by year round high temperatures and seasonal heavy rain. The mean temperatures during the day and night are 32ºC and 22ºC respectively. Although Peninsular Malaysia is outside the belt of tropical cyclones, it is influenced by monsoon winds from the southwest during May to September and from the northeast from October to March. The average rainfall is about 2,540 mm per year with a maximum of 5,080 mm and a minimum of 1,650 mm. Humidity is always high and ranges from 70 to 98 percent and the sky is cloudy most of the day, especially during the monsoon months. Thunderstorms occur year-round, on average 200 days a year with a peak in the afternoons, except for night-thunder in the coastal plains. In Sabah, temperatures in the lowlands average 26.3ºC and decrease by 0.6ºC for every 100 m rise in elevation to 2,000 m and then by 0.5ºC thereafter. The average annual rainfall in Sabah varies from 1,730 mm to 5,080 mm and is subjected to seasonal variation due to the northeast monsoon from October or November to February and the southeast monsoon from May to August or September. Although Sabah lies south of the typhoon belt, it experiences severe rain and wind storms which usually occur in association with typhoons over the Philippine islands to the north. Humidity is generally high at 70-90 percent and rising to 100 percent at night. The climate of Sarawak is dominated by the northeast monsoon which starts in November and lasts until March. This is a period of heavy and persistent rain accompanied, in the coastal areas, by strong winds. In the inland areas, the rainfall between March and October is relatively light at 120 mm-150 mm per month although the actual rainfall varies considerably from area to area. The mean air temperatures range from 26º to 29ºC while the mean annual rainfall is 3,000 mm-4,000 mm over the greater part of the State. The humidity like in the other parts of Malaysia is constantly high. In Malaysia, the legislative and thereby, executive authority over the management of natural resources, including forests, is allocated between the Federal and State Governments by the Malaysian Constitution. In this regard, under Article 74 (2) of the Malaysian Constitution, forestry comes under the jurisdiction of the respective State Governments. As such, each State is empowered to enact laws on forestry and to formulate forestry policy independently. The executive authority of the Federal Government only extends to the provision of advice and technical assistance to the States, training, the conduct of research, and in the maintenance of experimental and demonstration stations. In order to facilitate the adoption of a coordinated and common approach to forestry, as well as reconcile cross-sectoral policies that interface with the forestry sector, the National Forestry Council (NFC) was established on 20 December 1971 by the National Land Council (NLC). The NLC is empowered under the Malaysian Constitution to formulate a national policy for the promotion and control of utilization of land for mining, agriculture and forestry. The NFC, chaired by the Deputy Prime Minister and comprising the Chief Ministers of the thirteen Malaysian States, the Minister of Natural Resources and Environment, and other Federal Ministers whose portfolios have an impact on the forestry sector, such as finance; trade; agriculture and agro-based industry; plantation industries and commodities; and science, technology and innovations; and heads of the forestry services of Peninsular Malaysia, Sabah and Sarawak; serves as a forum for the Federal and the State Governments to discuss and resolve common problems and issues relating to forestry policy, administration and management, as well as to enhance cooperation between the Federal and State Governments, so as to ensure a coordinated approach in the implementation of policies and programs related to forestry. All the decisions of the NFC have to be endorsed by the NLC. The responsibility for implementing the decisions of the NFC lies with the State Governments unless it is within the authority of the Federal Government. As of 2010, the NFC was disbanded and all forestry matters revert back to the NLC which in any case is the highest body that formulates relevant land related policies. * RESEARCH AND EDUCATION FOREST for the conduct of research and education. (xii) to develop a comprehensive program in community forestry to cater for the needs of the rural and urban communities. 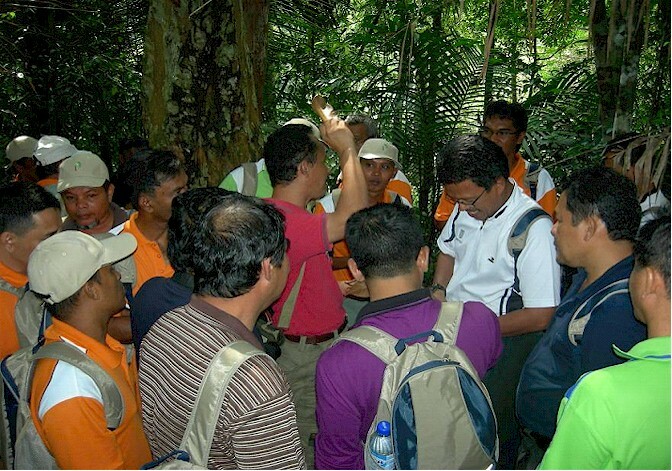 To ensure effective forest management and the implementation of the National Forestry Policy in Malaysia, various forestry enactments and ordinances were formulated and enforced by the respective State authorities since the early 1900s. These enactments and ordinances were further uniformized and strengthened in areas of forest management planning and operations through the adoption of the National Forestry Act and the Wood-based Industries Act in October 1984. These two Acts are currently being enforced by all the States in Peninsular Malaysia as Sabah and Sarawak have their own forest and forest-related enactments and ordinances, such as the Sabah Forest Enactment 1968 amended 1992, Sabah Parks Enactment 1984, Sabah Cultural Heritage (Conservation) Enactment 1997, Sabah Wildlife Conservation Enactment 1997, Sabah Water Resources Enactment 1998, Sabah Biodiversity Enactment 2000, Sabah Environment Protection Enactment 2002, Sarawak Forests Ordinance 1954 amended 1999, Sarawak National Parks and Nature Reserves Ordinance 1998, Sarawak Wildlife Protection Ordinance 1998, Sarawak Biodiversity Centre Ordinance 1997, and the Sarawak Natural Resource and Environment Ordinance 1994. These enactments and ordinances are also augmented by other legislation on land use, such as the Water Enactment 1935, Land Conservation Act 1960, Environmental Quality Act 1974, National Parks Act 1980, and the Wildlife Conservation Act 2010. (xi) forest for federal purposes. (iv) prepare and implement programs relating to amenity forests. The tropical rain forests of Malaysia are extremely complex ecosystems and are richer in tree species than in similar areas of Africa and South America. They are, in fact, the most species-rich plant communities known anywhere in the world and which have evolved over million of years. There are at least 15,000 species of flowering plants, of which 2,500 are tree species; 286 species of mammals; 600 species of birds; 140 species of snakes; 150 species of frogs and thousands of species of insects, many of which are still being documented. Of the tree species, more than 120 species are used for timber production. In addition, over 1,300 plant species have been identified as having potential pharmaceutical properties with some of them currently being used as traditional herbal medicine. The total area under forests in Malaysia has been estimated to be 18.31 million ha or 55.8 percent of its total land area with the dry inland forests representing approximately 87.2 percent of the total natural forests. These forests are characterized by the predominance of the family Dipterocarpaceae with many of the species of the genera Anisoptera, Dipterocarpus, Dryobalanops, Hopea, Shorea and Parashorea. In this regard, the total area of forest plantations is estimated at only 2.2 percent of the total forest areas, planted mainly with Acacia mangium, Gmelina arborea, Paraserianthes falcataria, and Hevea timber producing species. Recognizing the crucial role of forests is not only in the production of timber, but more importantly in the conservation of soil, water and wildlife, as well as in the protection of the environment, Malaysia has a total of 14.5 million ha or 44.2 percent of the total land area designated as PRFs which is under sustainable management for both production and conservation of wild fauna and flora. These forests are found in the plains, undulating land and foothills to an elevation of about 300 m above sea level and are primary climatic climax forests comprising many thousands of species of trees, as well as shrubs, herbs and woody climbers. The upper or emergent storey is usually about 30 m to 45 m high, though trees nearly 60 m in height are often present, but are rather discontinuous. This upper or emergent storey is usually characterized by a high occurrence of the family Dipterocarpaceae with many of the species of the genera Anisoptera, Dipterocarpus, Dryobalanops, Hopea, Shorea and Parashorea though in some forests they are rare or almost absent. The main storey or second tree layer, which occupies a region of about 20 m to 30 m from the ground, forms a continuous canopy except immediately below the large emergent storey trees. This storey consists of young trees of the normally upper storey species together, predominantly, with members of the families Burseraceae, Guttiferae, Myristicaceae, Mytaceae (Eugenia species) and Sapotaceae. The understorey or third tree layer consists of saplings of the upper two storeys together, mainly with members of such families as Annonaceae, Euphorbiaceae, Flacourtiaceae and Rubiaceae. The density of the shrub layer is very variable, comprising, mainly young seedlings of the other layers and lianas with some aroids and ferns near streams and in moist valleys while epiphytes are usually very poorly represented. These forests occur on the inland ranges between the approximate altitudinal limits of 300 m and 1,000 m. Aspect and site however are important factors and the forests have a tendency to be found at lower limits, down to 150 m above sea level, on exposed ridges and at higher limits in the more sheltered valleys. The main difference between the lowland diptercocarp and hill diptercocarp forest is a shift in the floristic composition of the dominants in the upper and main tree storeys. The large trees in hill forest are usually slightly smaller and less tall than the tallest in the lowland forest, except for the big trees on the ridge tops which are in general a little taller. The density of trees on ridge tops is greater than that in the lowland forest, and there are correspondingly fewer trees in the understorey and in the lower part of the main storey. The vegetation of hill slopes, particularly steep slopes, is often poorly stocked in woody species. The understorey is usually very rich in stemmed palms, such as Arenga westerhoutii, Oncosperma horrida and Orania macrocladus; stemless palms such as Licuala species; and rattans such as Calamus castaneus. In valley bottoms large woody species are also poorly represented and the forest is characterized by the richness in the ground flora and shrub layer where Alocasia species, Colocasia species, Donax grandis and many other ground ferns are commonly found. These forests are found on the higher hills between the approximate altitudinal limits of 750 m to 1,200 m, but as in the case of the hill dipterocarp forests they may also be found in narrower and much lower belt on coastal ranges or on isolated mountains. The species are very different from those found in the hill dipterocarp forests. Although the forest structure is much the same, namely three-layered, the upper layer is less tall and varies between 25 m and 30 m in height and with a more even upper canopy level. The second and upper tree layers are frequently less distinct as separate entities. The family Dipterocarpaceae is represented by only a few species and this forest is often characterized by the presence of Shorea platyclados. The shrub layer in this forest is often characterized by the presence of rattans and dwarf palms while the ground flora by species of Argostemma (Rubiaceae), Sonerila (Melastomaceae), Selaginella atroviridis and the fern Thelypteris chalamydophora. These forests are found above the upper dipterocarp forests in the altitudinal range of 1,000 m to 1,500 m but these limits vary considerably according to the locality. They are in general two tree-layered forests with tree heights varying from 20 m to 25 m. The upper canopy is fairly even with emergents absent, and trees are relatively short boled, and are not strongly buttressed. Dipterocarps are not normally found in these forests and the common and characteristics species are representatives of the families Fagaceae with many of the genera Quercus, Lithocarpus and Castanopsis, and Lauraceae. The climbers Aeschynanthus species and Poikilospermum and the fern Asplenium nidus are common epiphytes while rattans, stemmed palms and tree ferns dominate the shrub layer with liverworts and mosses being the ground flora. These forests occur in the cloud belt above the lower montane forests. They may however be found on exposed ridges and summits at lower altitudes of less than 1,500 m. They differ from the lower montane forests in specific composition, typically a reduction to a single tree layer in structure and a general dwarfing of the forests to about 10 m tall. Besides, there is normally a greater increase in development of liverworts, mosses and filmy ferns, both on the trucks of the trees and on the ground. Sphagnum species are common. The forest is characterized by the prevalence of ericaceous species, such as Pieris ovalifolia, Rhododendron species and Vaccinium species. Undergrowth species include Argostemma and Burmannia species Epiphytic orchids are common and rhododendrons also occur frequently. Heath or Kerangas forests are generally included as part of “hill forests” and are found mainly in Sabah and Sarawak. They contain trees of poor form and small size and are generally found on white soils, or on beach terraces at all elevations, or in weathered steep ridges at higher elevations. The main species are Cassuarina, Agathis alba, Dacrydium, Tristania and Shorea albida. Mangrove swamp forests are confined to muddy shores, lagoons, and the estuaries of tidal rivers. The vegetation is simple in structure, 6 m to 25 m in height depending on the community, with a comparatively even and unbroken canopy and a very poor understorey layer which is even frequently absent, and poor in species. The principal tree species are restricted to such habitats, and are frequently characterized by special root formations, such as stilt roots in Rhizophora species and pneumatophores in Avicennia, Bruguiera, Sonneratia and Xylocarpus species. Many of the principal tree species are also characterized by the habit of their seeds which start to germinate long before the fruits are ripe, such as in Bruguiera, Ceriops, Kandelia and Rhizophora species. These rain forests are of a very special type found on peat with depth ranging from 0.5 m to about 6 m. These forests occur just behind the coastline and have a three-layered tree structure. This comprises a broken upper emergent layer, often reaching to a height of 30 m to 35 m and is frequently represented by scattered truly emergent trees and a fairy continuous understorey of considerable depth, usually ranging from about 10 m to 20 m above ground level. Frequently a dense thicket of stemless palms is found in water-logged area, otherwise the “shrub’ layer is in general rather sparse. The ground flora is comparatively poor both in species and in cover. Species represented in these forests include Amoora rubiginosa, Anisoptera marginata, Blumeodendron tokbrai, Calophyllum retusum, Cratoxylon arborescens, Gonystylus bancanus, Shorea albida, Dactylocladus stenostachys and Eugenia species. The freshwater alluvial swamp forests usually occur under varying degrees of inundation and under varying circumstances. Accordingly their floristic composition the general structure varies enormously from open scrub with a few large 25 m to 30 m tall scattered trees, a dense 10 m to 20 m tall pole forest, to a 30 m tall peat swamp-like forest where the predominance of single species is common. Common tree species that are found in some of these swamp forests are Koompassia malaccensis, Calophyllum, Eugenia, Medhuca, Melanorrhoea and Palaquium species. Numerous types occur as a narrow strip along the banks of the estuaries, rivers and streams. Their compositions and hence their structures vary enormously and depend on tidal influence, the rate of water flow, the elevation, the width of the river or stream, the nature and aspect of the terrain, and the enrichment of the site by water or silt. Common tree species found in these riparian fringes or on the low-lying land beyond the banks in the lowlands are Artocarpus peduncularis, Ficus retusa, Intsia palembanica, Dipterocarpus coriaceus, Calophyllum, Cratoxylon, Dialium and Hopea species. In managing the natural tropical forests of Malaysia, the forests are classified into three broad forest types, namely the dry inland forest or dipterocarp forest, peat swamp forest and mangrove forest. Under sustainable forest management, the harvesting prescriptions and cutting cycle prescribed for each forest type in each State would depend on its stand structure, species composition and stocking, as well as the soil and climatic conditions. 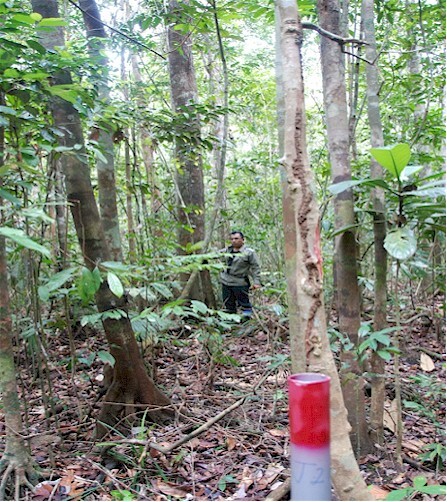 Under the Selective Management System (SMS) in Peninsular Malaysia, a 30-year cutting cycle is adopted where the cutting limits prescribed for the group of dipterocarp species would range from 50-65 cm diameter at breast height (dbh) while those prescribed for the group of non-dipterocarp species would range from 45-55 cm dbh, with the maximum volume allowed to be harvested being 85 m3/ha. The difference in the cutting limits prescribed between the dipterocarp species and that of the non-dipterocarp species would be at least 5 cm in order to conserve a higher percentage of dipterocarp species for the next cut. Peninsular Malaysia also practices the Modified Malayan Uniform System (MUS) that removes the mature crop in one single felling of all trees down to 45 cm dbh for all species. In pursuance of sound management objectives, forest harvesting in Sabah is undertaken in accordance with the prescribed silvicultural practices of promoting the development of natural regeneration. In this context, the dipterocarp forest in Sabah is selectively harvested based on a 50-year cutting cycle and only trees having size of 60 cm dbh and above are removed. In Sarawak, the cutting cycle prescribed for the dipterocarp forest is 25 years with the prescribed cutting limits for the dipterocarp and non-dipterocarp species being 60 cm dbh and 45 cm dbh and above respectively, where on average the number of trees harvested ranges from 7 to 9 trees/ha with an output of 54 m3/ha. The peat swamp forest in Peninsular Malaysia is managed under the ‘modified’ SMS where higher cutting limits are prescribed due to a lower stocking of natural regeneration in the stand. Research and development efforts are currently being taken to formulate more effective management system for this forest type. In this regard, the cutting cycle adopted for the peat swamp forest in Sarawak is 45 years with the prescribed cutting limits for Gonystylus bancanus (Ramin) and that of the other species being 40 cm dbh and 50 cm dbh and above respectively. 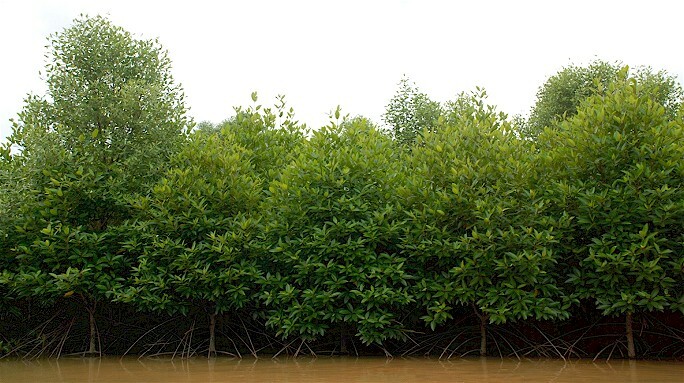 The mangrove forest, in general, is managed under cutting cycles varying between 20 to 30 years. However, currently there is no commercial harvesting of mangrove forests in Sabah, while in Peninsular Malaysia mature trees are clear-felled with the retention of seven mother trees per ha, and a three meter wide river bank and coastal strip for ensuring adequate natural regeneration and in the protection of the environment. In Sarawak, under sustainable forest management, the mangrove forests are managed under a 20-year cutting cycle with a prescribed minimum cutting limit of 7 cm dbh, while for those forests located in stateland and with no formal management plan the minimum cutting limit is prescribed at 12.7 cm dbh. As of 2012, a total of 4.65 million ha of Permanent Reserved Forest has been certified under the Malaysian Timber Certification Scheme (MTCS) which was endorsed by the Program for the Endorsement of Forest Certification Scheme (PEFC) in May 2009. Only an estimated 0.2 million ha are certified by the Forest Stewardship Council (FSC). Over the years, Malaysia has been establishing a network of protected areas for the conservation of biological diversity. Some of these national parks, wildlife reserves, nature parks, bird sanctuaries and marine and state parks have been established since the 1930s. Malaysia’s largest national park, covering 434,351 ha, was gazetted as early as 1939. It comprises mainly virgin forests of various forest types according to altitudes and soil conditions. In its efforts to further conserve various forest and ecological types in their original conditions, the Forestry Departments have set aside pockets of virgin forest. These pockets, known as Virgin Jungle Reserves (VJRs), were established to serve as permanent nature reserves and natural arboreta, as controls for comparing harvested and silviculturally treated forests and as undisturbed natural forests for general ecological and botanical studies. Since its inception in the 1950s, 87 VJRs covering 23,002 ha have been established throughout Peninsular Malaysia while in Sabah, 50 VJRs have also been established covering an area of 91,914 ha. These VJRs represent samples of the many types of virgin forest found in the country which are located in the PRFs. Represented forest types include Mangrove Forest, Heath Forest, Peat Swamp Forest, Lowland Dipterocarp Forest, Hill Dipterocarp Forest, Upper Dipterocarp Forest and Montane Forest. As Malaysia is one of the 12 mega diversity areas in the world, the importance of biological diversity conservation was accorded high priority with the adoption of the National Policy on Biological Diversity in April 1998. The main thrust of the Policy is to identify and protect ‘hotspots’ that have high value for biological diversity conservation. It also includes the strengthening and integration of conservation programs, promotion of private sector participation in biological diversity conservation, and exploration and sustainable utilization of the genetic resources, as well as mitigation measures to reduce the adverse effects of anthropogenic activities on biological diversity. Malaysia is constantly reviewing the adequacy and appropriateness of current legislation to govern the collection of genetic resources and protect farmer’s rights, as well as to safeguard breeder’s intellectual property rights. Recognizing the important of transboundary collaboration in the protection and conservation of biological diversity, Malaysia together with Brunei Darussalam and Indonesia has embarked on the Heart of Borneo initiative. With the signing of the Heart of Borneo Declaration on 12 February 2007 in Bali, Indonesia, an area totaling up to 24 million ha will be designated as protected areas, production forests and sustainable land-use areas. For Malaysia, this initiative would support its efforts in eradicating poverty that is concentrated in the interior of Sabah and Sarawak. In fact, Malaysia has had good working experiences with Indonesia on transboundary conservation of biological diversity, namely the Lanjak-Entimau Wildlife Sanctuary, covering an area of 170,000 ha in Sarawak and the Betung Kerihun National Park, covering an area of 800,000 ha in Indonesia. Together, totaling almost one million ha, they represent one of the largest, most extensive, totally protected areas in the world. In addition, under the National Physical Plan (NPP), currently confined to Peninsular Malaysia as Sabah and Sarawak are governed by different planning legislation, the four major forest complexes in the Peninsula which are presently fragmented and divided will be reconnected to form “a Central Forest Spine (CFS)” from north to south, currently estimated to cover an area of 4.3 million ha. This unique continuous corridor which forms the backbone for a network of environmentally sensitive areas that include forests, lakes, highlands and wetlands will serve as a reservoir for biological diversity, provide protection areas for catchments, and create environments for nature and ecotourism. (ix) other activities, which may affect forest, such as coastal reclamation and hydropower projects. The NPP also requires State and local authorities to cooperate with the Federal Government to identify and rank environmentally sensitive areas (ESA) in the country, such as forest lands, marine parks, catchment areas, drainage areas, recharge areas, erosion risk and elevated areas into broad three categories. In the first category or ESA Rank 1, no development, agriculture or logging is allowed except for low-impact natural tourism, research and education. These include all protected areas, potential protected areas, wetlands, turtle landing sites, catchment areas of existing and proposed dams and areas with elevation above 1,000 m above mean sea level (a.m.s.l). In the second category or ESA Rank 2, no development or agriculture is allowed, but sustainable logging and low impact nature tourism may be permitted subject to local constraints. This category includes all forests, wildlife corridors, buffer zones around ESA Rank 1 areas and areas with elevation between 300 and 1,000 m a.m.s.l. In the third category or EAS Rank 3, only controlled development will be permitted where the type and intensity of the development will be strictly controlled depending on the nature of the constraints. These include all marine park islands, buffer zones around ESA Rank 2 areas, catchment areas for water intakes, areas for ground water extraction (well fields), areas with erosion risk greater than 150 tonnes/ha/year, areas experiencing critical or signification coastal erosion and areas between 150 and 300 m a.m.s.l. In view of the declining wood supply and recognizing that forest plantations can yield a higher volume of timber per unit area and in a shorter time will relieve pressure from over-harvesting the natural forests, as well as to encourage private sector’s investment in forest plantation development to supplement future wood supply of the country, a National Committee on Forest Plantation Development with full participation by the private sector was formed in April 1992 to formulate a national strategy and action plan for the promotion and effective implementation of the forest plantation programs. In this context, the Government of Malaysia reviewed the existing fiscal incentives and granted full tax exemption under the Pioneer Status for ten years or 100 percent tax exemption under the Investment Tax Allowance for five years, effective from 29 October 1993 for forest plantation establishment undertaken by the private sector. To further encourage the private sector to establish and develop forest plantations, effective from the year of assessment of income 1999, additional incentives were granted by the Government to enable private company undertaking forest plantation projects to offset qualifying capital expenditures, such as in the clearing and preparation of land, planting of timber seedlings, provision of plant and machinery, building of access roads and bridges, and construction or purchase of buildings, against income from other business sources of the company under Schedule 4A of the Approved Agricultural Projects. The rotation cycle for the 75 approved species varies from a minimum of 6 years to a maximum of 50 years depending on the type of species planted, while the minimum area planted should be at least 50 ha. (iv) enrichment planting, silviculture, pest and diseases control and fire management. Malaysia is a party to the RAMSAR Convention on Wetlands which Malaysia ratified on 10 November 1994 and came into force in Malaysia on 10 March 1995; the Convention on Biological Diversity (CBD) which Malaysia ratified on 24 June 1994 and came into force in Malaysia on 22 September 1994; and the United Nations Framework Convention on Climate Change (UNFCCC) which Malaysia ratified on 13 July 1994 and came into force in Malaysia on 11 October 1994, as well as the Kyoto Protocol to the UNFCCC which Malaysia ratified on 4 September 2002 and came into force in Malaysia on 16 February 2005. Malaysia had also ratified the Cartagena Protocol on Biosafety to the CBD on 3 September 2003 which came into force in Malaysia on 2 December 2003 and the International Tropical Timber Agreement (ITTA), 2006 on 28 September 2007, as well as acceded to the Convention on International Trade in Endangered Species of Wild Fauna and Flora (CITES) in October 1977. As of the 2010 census, the population of Malaysia was 28,334,135 making it the 42nd most populated country. An estimated 70 percent of the population is urban which is mainly concentrated in Peninsular Malaysia where 20 million of the people live. For almost 50 years Malaysia has had one of the best economic records in Asia, with GDP growing an average 6.5 percent. The economy has traditionally been fuelled by its natural resources, but is expanding in the sectors of science, tourism, commerce and medical tourism. Notwithstanding this, the Malaysian Government is fully committed to balance economic growth with environmental protection, including managing its forest resources sustainably in the overall context of sustainable development. This renewable asset will continue to be managed in accordance with national objectives and priorities so that the country will continue to enjoy the benefits generated from the forest and forest industries. The long-term viability for the sound and sustainable development, management and conservation of the forest resources in Malaysia will be one that balances the needs of the economy, environment and ecology.